You’ve reached a one-stop shop for a comedy performer and his friends who will bring a touch of fun and laughter to any occasion. Whether it’s a corporate event, family party, a stage show or any kind of celebration, Tony can make your special day go off with a bang and a touch of class! Anything featuring a funnyman and a mic is possible. Tony has the best 'black notebook' in the entertainment industry. 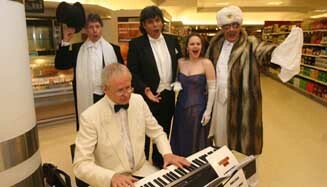 Whatever your event he'll find the right combination of singers, dancers, magicians and comedy characters. Just name it or let Tony plan an event for you. 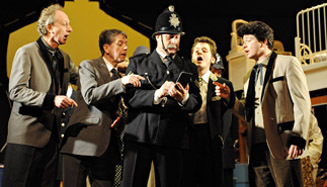 Tony and his team can enliven parties with comedy characters who mingle with your guests causing mayhem and madness. There are laughs aplenty with high-calibre ad lib humour and a song for every occasion. Tony can work with a broad range of technical partners to give you or your clients the exact mixture of services required. Our photographers can make sure you get the perfect video record or still pictures of your function. We can pull off some fantastic stunts for you with our action colleagues and we’ll dress you up with one of the UK’s leading theatrical costumiers.